He was the first black man to play in the major leagues, ending six decades of racial segregation, and a first-ballot Hall of Famer. 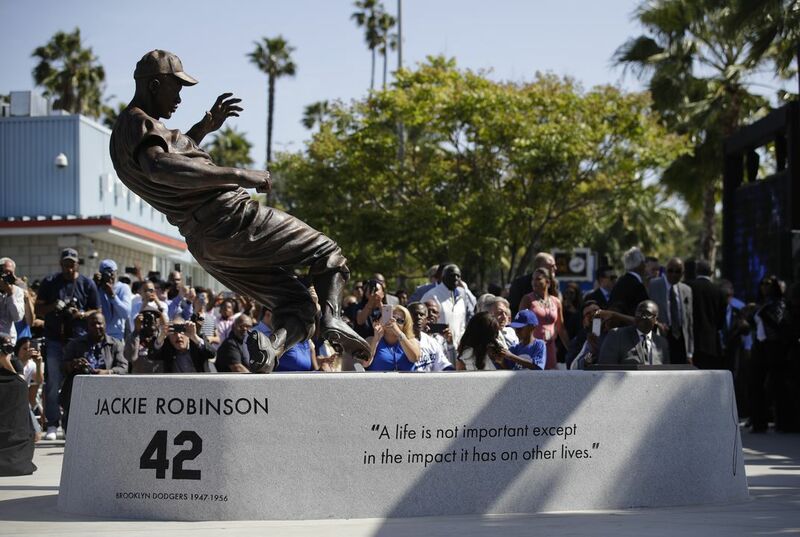 Fittingly, Jackie Robinson is the first to be honored with a statue at Dodger Stadium in Los Angeles. 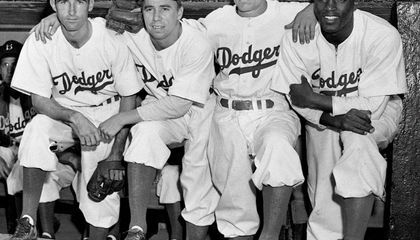 It was unveiled April 15 on the 70th anniversary of his debut with the Brooklyn Dodgers. Since 2004, baseball has honored Robinson's barrier-breaking career every April, the one day every player on every team wears his retired No. 42 number. The 77-inch tall bronze statue depicts Robinson as a rookie in 1947 stealing home, a nod to his aggressive baserunning. It weighs 700 pounds and is secured with a 150-pound steel rod. It stands in the left field reserve plaza, with views of downtown Los Angeles in one direction and Elysian Park in the other. Now 94, Rachel Robinson came from the East Coast to attend the unveiling, along with daughter Sharon and son David. Their other son, Jackie Jr., died in a car accident in 1971. They found just two of his existing statues depict him playing baseball, while the rest commemorate Robinson's social achievements or association with a particular location. Sharon Robinson views the statue as a fitting connection between her father's California roots and his 10-year Hall of Fame career spent in New York. How could baseball affect civil rights? Baseball is a sport that has changed the culture of every race. Race doesn't matter in baseball, ever since Jackie Robinson, baseball has been a race friendly game. Baseball can bring people together from all over and make the world a better place. In the past baseball has affected civil rights and it can today too. Baseball is america's past time and has a heavy influence on today's society. Baseball could affect civil rights both positively and negatively. Depending on what right is being affected mainly depends on the views of the ball club and the players playing withing the organization. Baseball could affect civil rights because its not about the race or the wealth, its about the game. Back in the day when Jackie Robinson was in the MLB it wasn't about the race it was just about who was the best player. So instead of focusing on race just focus on the game at hand. Mike also agree with u..take words out my mouth ???? It affect a lot of people,because just say it not about color..but playing the game u love.